After World War II, Japan sought to regenerate its auto-manufacturing industry. During the war, needing to produce trucks, buses and military equipment in large quantities with little specialization, Japanese plants could, and did, mimic the production strategies and large lot sizes of American automakers. But after the war, Japanese manufacturers shifted to satisfy domestic demand. Here, vehicle and part lot sizes frequently numbered only in the hundreds or, at most, a few tens of thousands. Whereas in the industrial age the goal always had been higher and higher production volumes with as little variety as possible to achieve economy of scale, the end of World War II signaled a manufacturing sea change. Led by Japan, which had to find ways to produce products economically in lower volumes, the quest to profitably manufacture smaller and smaller part lots of greater variety began. And it continues to this day. As job-shop fabricators know, today’s work schedule can see hundreds of part jobs with part lot sizes topping out in the hundreds—or less. Given this fact, throughput must be optimized. That is the whole idea behind the development of combination laser-punching machines. These machines, in operation since the 1970s, can deliver benefits above and beyond those of separate machines, if fabricators focus on throughput as opposed to singular process time. 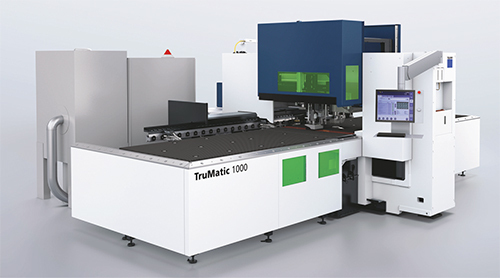 “The key to job-shop sheetmetal fabricators meeting low-volume, high-variety challenges is having a piece of equipment that can deliver a number of processes in one platform,” says Brian Welz, product group manager at TRUMPF Inc., Farmington, CT, speaking of the efficiencies of combination machines. 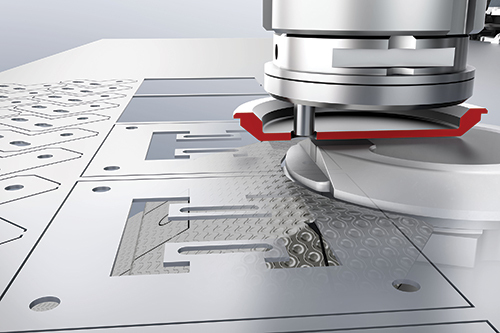 Advances in punching and laser technology have made combination punching and laser-cutting machines potent allies in helping fabricators navigate a changing manufacturing world where part mix increases while job volumes drop. The flexibility of two systems in one enable multiple processes to take place at a single station, cutting time and costs associated with secondary processes performed on other machinery. “At your production facility, every day is like race day,” he offers. “How many laps do I need to win the race? Today, I need to go 500 laps. Some days, with breakdowns and other problems, I may only go 480 laps. Other days I may go 520. To succeed, I need to keep my car racing on the track. Success means being able to change over and move from job to job to job and progress, turning those laps and producing those parts to satisfy production requirements. Successful job shops gain efficiencies by performing as many actions as possible at a single location. In assessing the value of a combination punching machine and laser cutter, Welz explains, fabricators should consider the entire throughput time, and not be hung up on processing time for a single operation. Focusing on single-operation time may lead fabricators to send parts from location to location, where advantages of a quick operation are more than negated by the aforementioned travel inefficiencies. While a laser-cutting machine can take 1 to 2 sec. to create a hole, a punch machine may take a quarter of a second, if that. Welz cautions not to try switching from machine to machine to capture those speed differences. Multiply that by the number of processes and station changes, and the efficiencies of a laser or punching machine are removed. Combination laser and punching machines certainly have shown their worth, bringing the best of both processes in a single platform, and incorporating advances in each of the technologies. An example, explains Welz, is Trumpf’s 2016 introduction of a new combination punching and fiber-laser machine.